The gregarious Mrs. E loves to throw dinner parties. We save the extra $30-$40 that would have gone to the sitter and get to pour it into the dinner. “Pour” being the operative word. We usually splurge on a bottle that we wouldn’t bring home for just the two of us. But sometimes we decide to spend a little more on cheese for appetizers or after dinner. 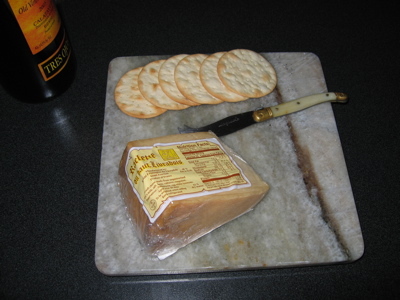 The footed marbled slab in the (staged) photo above is our cheese tray. Marble is always elegant and also serves the dual purpose of keeping the cheese from getting too runny since it stays cold. I got mine the old fashioned way. It was Mom and Dad’s…. Rounding up your own great looking piece of marble is as easy as visiting your local Lowe’s Home Improvement Store or tile shop. It may not be as highly polished or come with little brass feet, but hey! What can you expect for about $10? A little varnish and some glue could take care of that. Of course, the advantage of ordering marble that is usually used for countertops is that it has been sealed and polished. But I’m not sure if you could get a single tile…. This entry was posted in Entertaining and tagged dinner party, Entertaining, food. Bookmark the permalink. … and put those little rubber feet on the bottom so it doesn’t scratch the wood furniture, or slide around when you’re cutting. Great idea. Although ours doesn’t slide much, perhaps because of the weight? Or the stack of magazines and books that cover our cocktail (and every other flat surface) table?